Tired, and want to simply relax? Netbox says it has everything you need for a relaxing break from the everyday stresses. 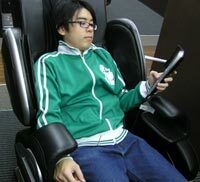 Netbox is a relaxation place, with locations in Uruma City and Okinawa City conveniently located for GI’s and families. Each offers internet, massage chairs, drinks with refills included, and soft ice cream, plus a 47” big screen television with surround sound. Visitors are welcome to bring their own computers, to connect at Netbox. The relaxation places offer some services free, while others are available to Netbox members. Private rooms, Play Station2 units and a comfortable veranda make relaxing an easy accomplishment. Showers and sleep areas make Netbox a “something for everyone” place to slow the pace for an afternoon or evening. Each location also offers inexpensive homemade meals, and Japanese ‘Manga’. 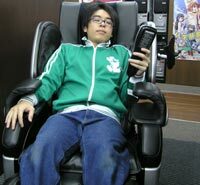 A popular feature of the Midorimachi site is an internet café with a Planetarium Room. The Uruma City Netbox is in Midorimachi, near Camp Courtney and White Beach. The Awase Branch in Okinawa City is close to Kadena Air Base. To book a private room, or learn more about the full range of services available, call Midorimachi Branch at (098) 972-7518, or Awase Branch at (098) 934-9000.